Ridgewood Tree is a tree service company primarily serving Bergen County, NJ. They provide a variety of tree services which they wanted represented on their website. 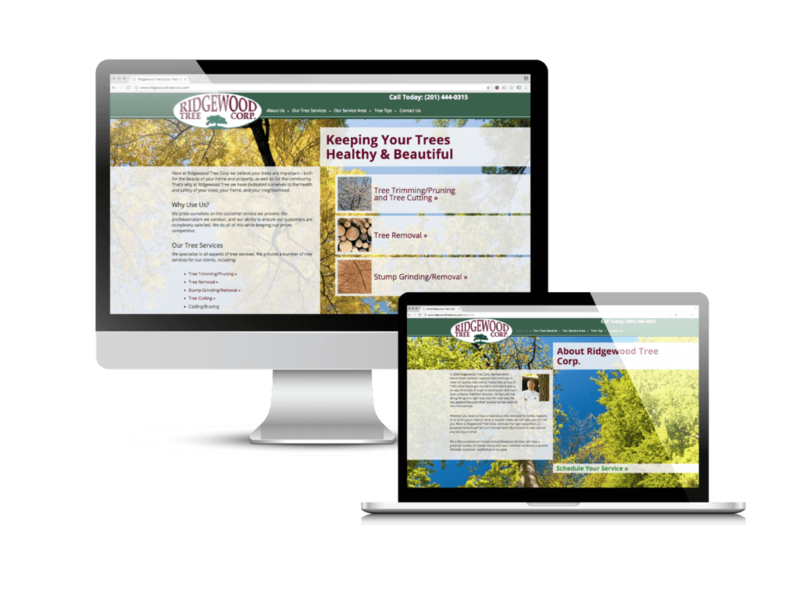 They came to us to help them create an online brochure where they could send traffic from social media sites as well as from other advertising and they could easily find the contact information, and expert tips about keeping your trees safe. To create an online brochure that they could send to people who wanted more information. To show them as experts in the tree care and management field. We created a visual website that stood out from their competition, clearly presented their services, and service area, and provided an area where they could add in tips for tree management and care, showing their industry expertise. They had a website which they could send online ad traffic to, as well as provide a link to interested customers to find out more information. They can also easily update it with new tree tips, and add/remove services and towns if they desire.